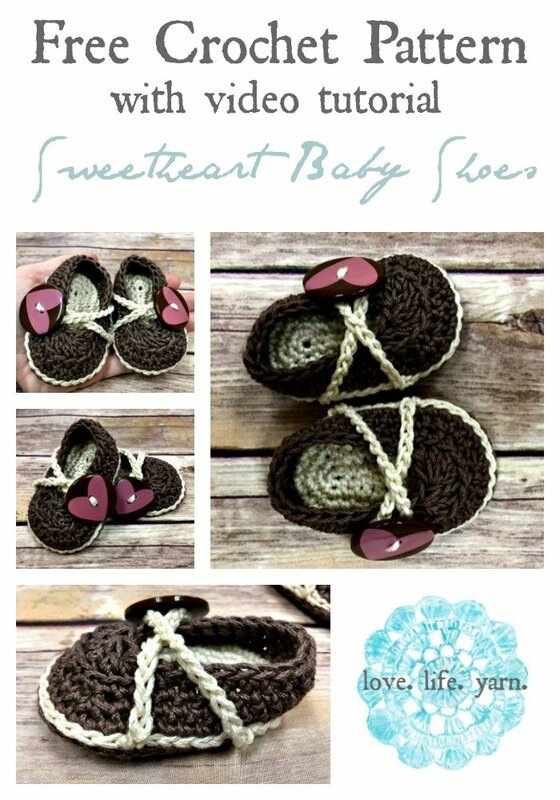 Sweetheart Baby Shoes - Free Crochet Pattern - love. life. yarn. 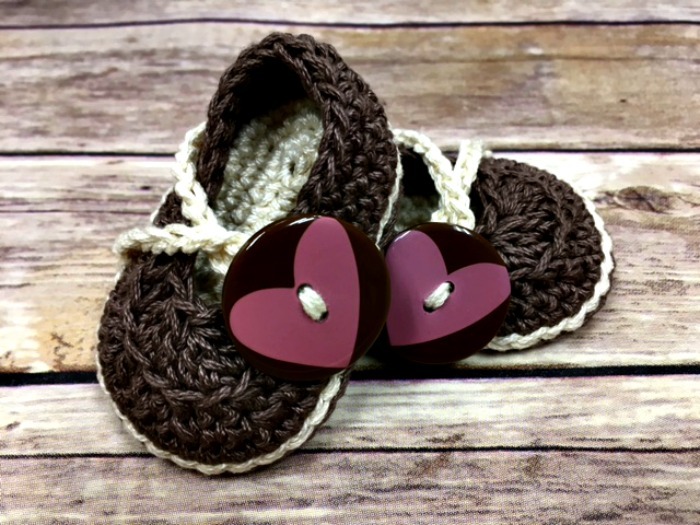 Valentine’s Day is just around the corner and I wanted to share these sweet little baby shoes with heart buttons. 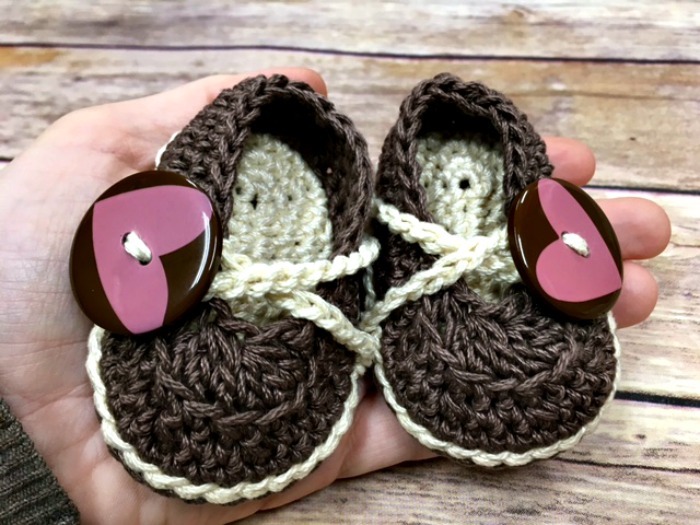 I enjoyed using Lion Brand 24/7 Cotton so much with the Basic Baby Booties that I wanted to use it again for this pattern. The colors went really well with these buttons that I picked up for a Valentine’s project. 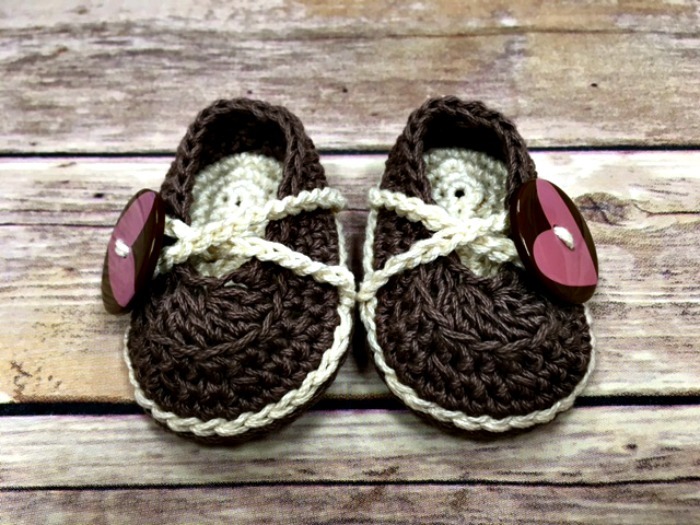 Baby shoes make such great gifts and don’t take long at all to make. These are made with a double sole (you make two soles for each shoe) and create the body of the shoe after combining the two. 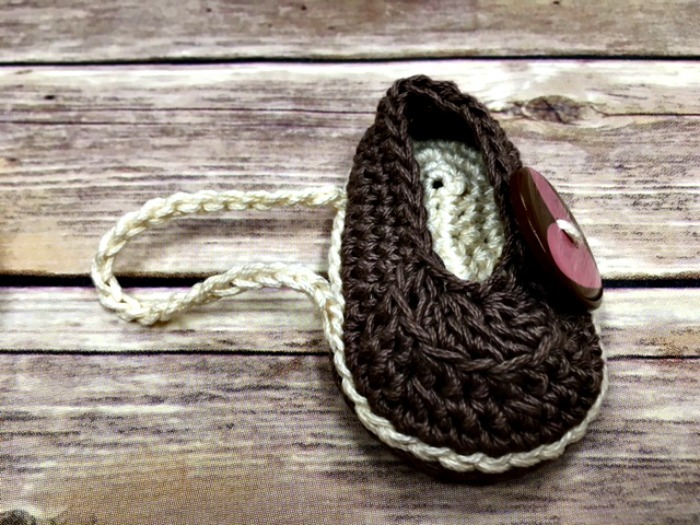 This is my favorite baby shoe sole and I use it in several of my patterns. After making the basic body of these shoes I decided it needed some type of strap but it didn’t look right going straight across the shoe so I crossed it and thought it finished off the shoe nicely. I hope you agree! **Please scroll down to see the tutorial video after the pattern. Enjoy!! For a large print, ad-free download of this pattern for $1.99 click HERE. *Note: I found these buttons at my local Joann but can’t find them on their website. Check your local craft store. Row 1: 3 sc in 2nd ch from hook, sc 2 (3), hdc 2, dc 1 (2), 7 dc in last ch. Working on opposite side of ch, dc 1 (2), hdc 2, sc 2 (3) – 20 (24) sts. Row 2: Work 2 sc in each of next 3 sts, sc 6 (8), 2 sc in each of next 5 sts, sc 6 (8) – 28 (32) sts. Row 3: *Sc 1, 2 sc in next st; repeat from * two more times, sc 6 (8), repeat from * five times, sc 6 (8) – 36 (40) sts. Row 4: *Sc 2, 2 sc in next st; repeat from * two more times, sc to end – 39 (43) sts. Round 1: Ch 1, sc in each slip st; join to first sc with slip st – 39 (43) sts. Round 2: Ch 1, sc 11 (13), *sc2, sc2tog; repeat from * three more times, sc 12 (14); join to first sc with slip st – 35 (39) sts. Round 3: Ch 1, sc, sc2tog, sc 9 (11), *sc, sc2tog; repeat from * three more times, sc 8 (10), sc2tog, sc; join to first sc with slip st – 29 (33) sts. Round 4: Ch 1, sc 9 (11), hdc2tog blo, (dc3tog blo) twice, hdc2tog blo, sc 10 (12) – 23 (27) sts. Make straps on opposite sides of shoe so the buttons are on the outside of each foot. 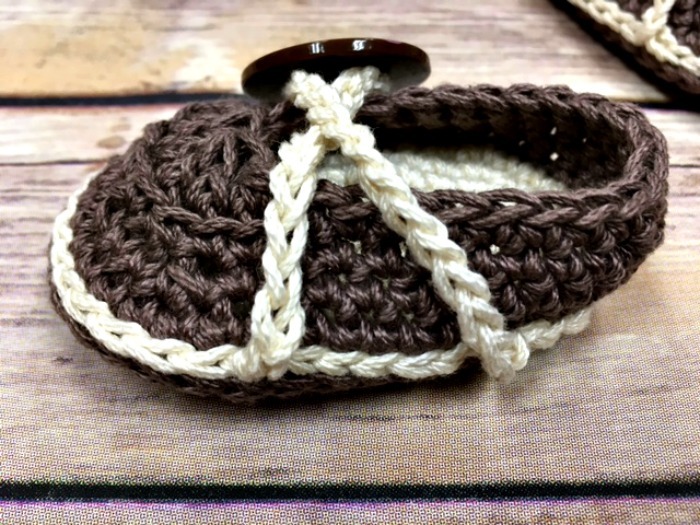 With CC, join yarn in CC sole even with top of round 4. Join with sl st in 6th ch back from original join. (See photo above). Make an invisible join the same way you do for slip stitches, then weave in ends. Sew buttons opposite straps. Weave in ends. 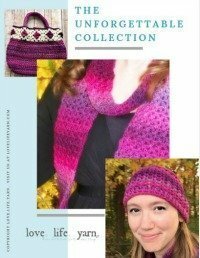 I hope you have enjoyed this free pattern! 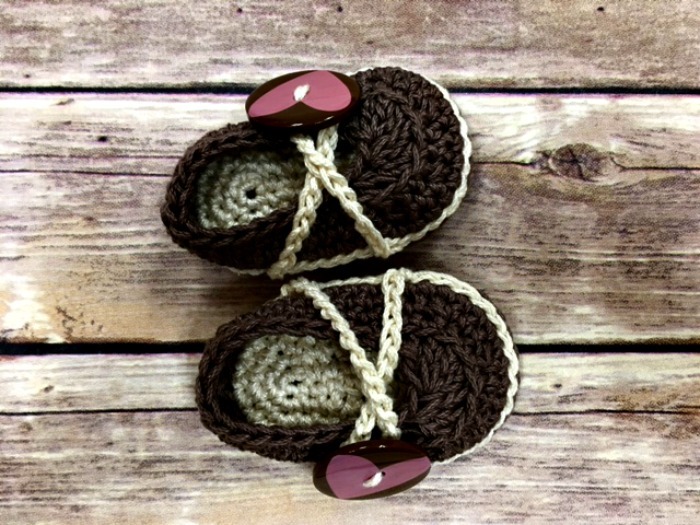 I am really, really enjoying creating these baby shoes patterns to share! If you like my free tutorial video please subscribe to my youtube channel!